1960 - China establishes diplomatic relations with Cuba; however, there is no significant contact between the nations during the Cold War. 1989 - Mutual visits between the Chinese and Cuban Foreign Ministers begin, and bi-lateral relations develop extensively. 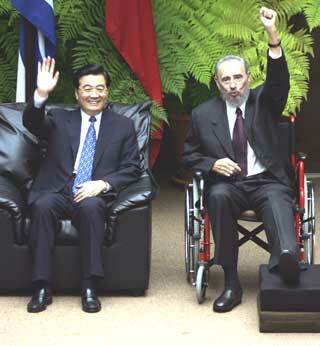 2004 - November - Chinese President Hu Jintao signs 16 agreements with Cuban leader Fidel Castro, and agrees to invest in the islands tourism, bio-technology and mining sectors. China also agrees to a 10-year extension for repayment of loans given to Cuba in the 1990s. Tourism - Discusses establishing a direct air route between the two capitals, making Havana a gateway for Chinese tourists touring South America. China is one of the most important tourist source countries in the world, and Cuba is the first nation in the Western Hemisphere to gain Approved Destination Status (ADS) from the Chinese government. Mining sectors - Currently Cuba's chief export is nickel, as Cuba has the third-largest nickel reserve in the world. China has an increasing need for nickel due to its growing manufactoring sector. Castro agreed to allow Chinese investors to explore nickel in undisclosed locations on the island, and reactivate a nickel plant abandoned by the Soviets a decade ago. Cuba predicts efforts will double their nickel output. While Cuba exports mainly nickel and sugar to China, China exports mostly machinery and electronic products to Cuba. China ranks as Cuba's 3rd largest trading partner after Venezuela and Spain. The trade volume between the two nations increased by 36% in 2004 alone. 2005 - May - Senior Chinese Communist Party leader Jia Quiglin visits Castro to discuss continued economic and political ties.